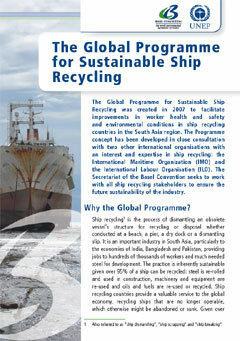 Marine plastic litter is an environmental problem occurring on a global scale today. 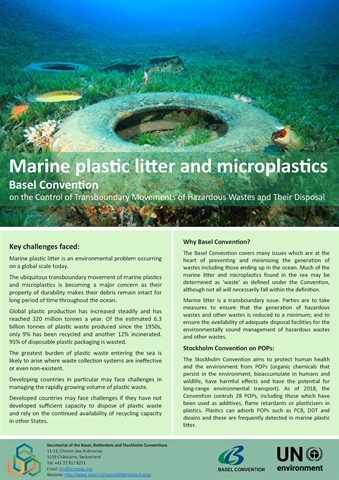 The ubiquitous transboundary movement of marine plastics and microplastics is becoming a major concern as their property of durability makes their debris remain intact for long period of time throughout the ocean. 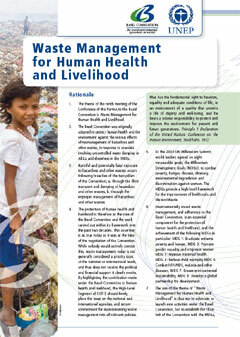 Escalating challenges in household waste management across the globe are widely acknowledged and draw attention to the importance of its environmentally sound management. 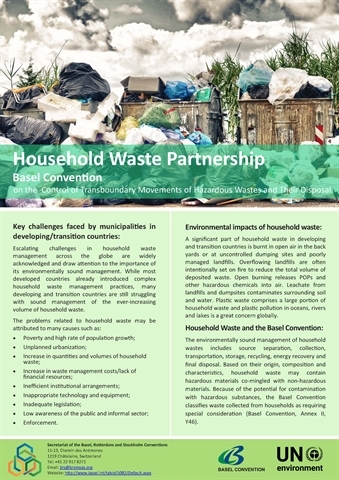 While most developed countries already introduced complex household waste management practices, many developing and transition countries are still struggling with sound management of the ever-increasing volume of household waste. 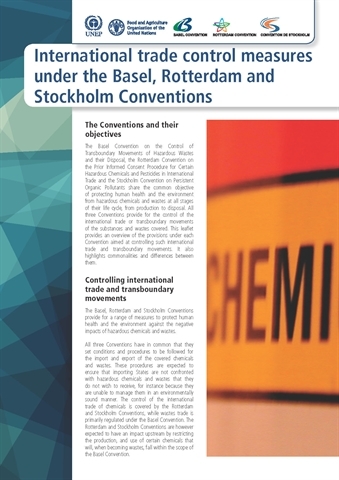 The Basel Convention on the Control of Transboundary Movements of Hazardous Wastes and their Disposal is the most comprehensive global environmental agreement on hazardous wastes and other wastes. 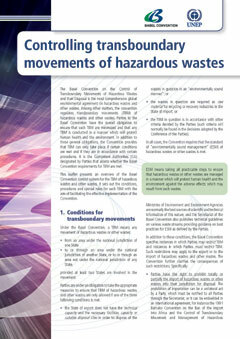 Among other matters, the Convention regulates transboundary movements (TBM) of hazardous wastes and other wastes. 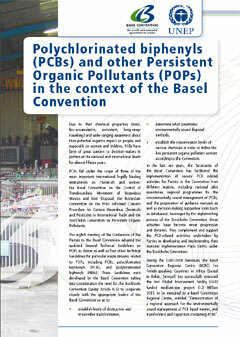 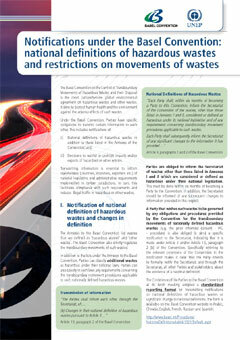 This leaflet presents an overview of the Basel Convention control system for the TBM of hazardous wastes and other wastes. 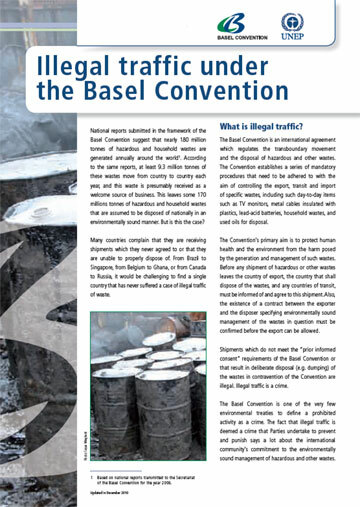 It sets out the conditions, procedures and special rules for such TBM with the aim of facilitating the effective implementation of the Convention. 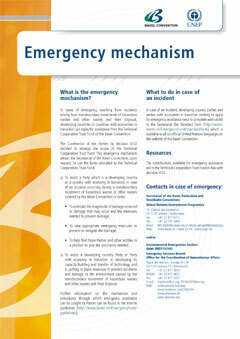 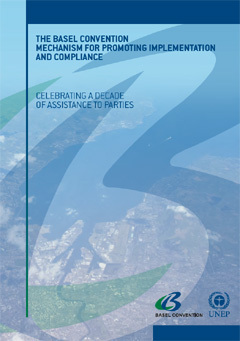 In cases of emergency resulting from incidents arising from transboundary movements of hazardous wastes and other wastes and their disposal, developing countries or countries with economies in transition can apply for assistance from the Technical Cooperation Trust Fund of the Basel Convention. 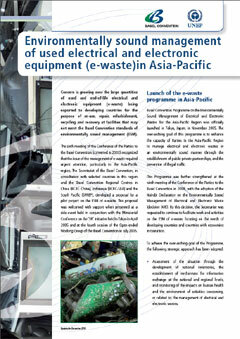 Concern is growing over the large quantities of used and end-of-life electrical and electronic equipment (e-waste) being exported to developing countries for the purpose of re-use, repair, refurbishment, recycling and recovery at facilities that may not meet the Basel Convention standards of environmentally sound management (ESM). 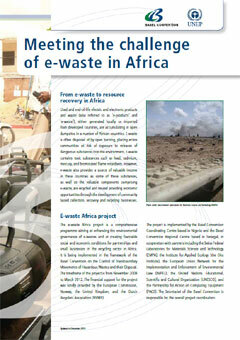 Used and end-of-life electric and electronic products and waste (also referred to as ‘e-products’ and ‘e-waste‘), either generated locally or imported from developed countries, are accumulating in open dumpsites in a number of African countries. 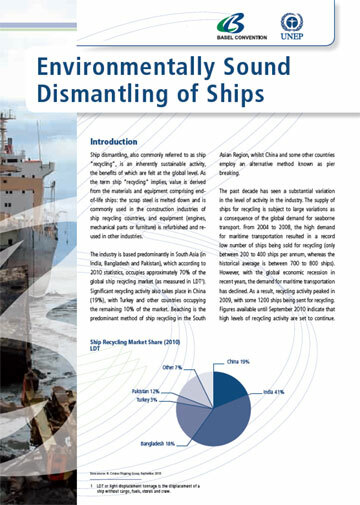 E-waste is often disposed of by open burning, placing entire communities at risk of exposure to releases of dangerous substances into the environment. 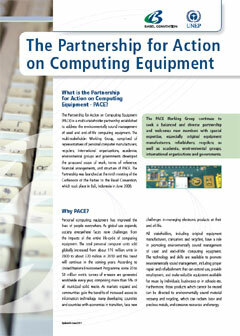 E-waste contains toxic substances such as lead, cadmium, mercury, and brominated flame retardants. 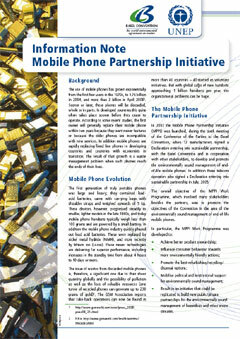 However, e-waste also provides a source of valuable income in these countries as some of these substances, as well as the valuable components comprising e-waste, are recycled and reused providing economic opportunities through the development of community based collection, recovery and recycling businesses. 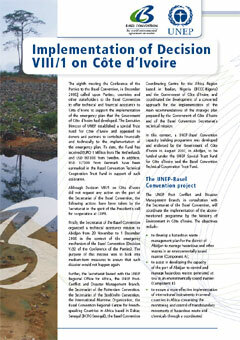 The eighth meeting the Conference of the Parties to the Basel Convention, in December 2006, called upon Parties, countries and other stakeholders to the Basel Convention to offer technical and financial assistance to Côte d’Ivoire to support the implementation of the emergency plan that the Government of Côte d’Ivoire had developed. 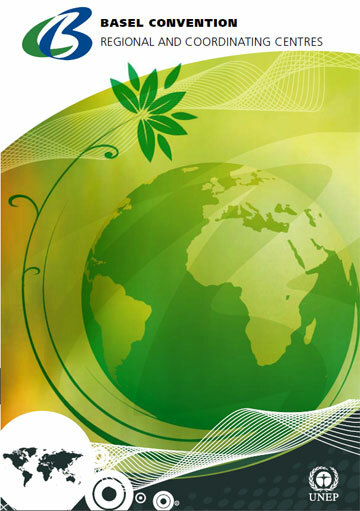 The Executive Director of UNEP established a special Trust Fund for Côte d’Ivoire and appealed to donors and partners to contribute financially and technically to the implementation of the emergency plan. 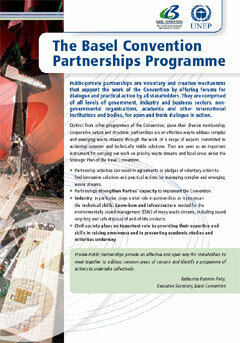 To date, the Fund has received EURO 1 Million from The Netherlands and USD 80’000 from Sweden. 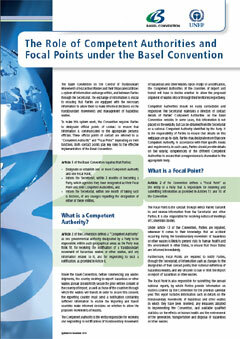 In addition, USD 32’000 from Denmark have been earmarked in the Basel Convention Technical Cooperation Trust Fund in support of such assistance.